This is the story of God’s guidance and work in and through the congregation of Peace Portal Alliance throughout the varied seasons of church life. South Surrey was a very different place in the early 1970’s. White Rock was often referred to as a “Geriatric Centre” and Crescent Beach as a “Hippie Haven.” But that changed as commuting became easier and more young families chose to settle in this area. Early in 1976 about 20 families attending Surrey Alliance joined with several other interested local families to explore the idea of starting a new church with a focus on ministry towards children, youth and families. The diverse and largely entrepreneurial founding group included people from 12 different denominational backgrounds. The first Sunday service was attended by 176 people on Sunday, April 4 in the Sunnyside United Church building. The church grew quickly to an average attendance of 300 people and necessitated a move to Sunnyside Elementary School at the corner of 152 St. and King George Highway where they met for the next four and a half years. God had blessed this new church plant with a healthy start. In June 1976, the new fellowship was formally organized as “The Crescent Park Community Church” of the Christian and Missionary Alliance. Rev. David T. Anderson was invited in October 1976 to serve as pastor. Within five years, these labourers had already significantly touched the community around them. 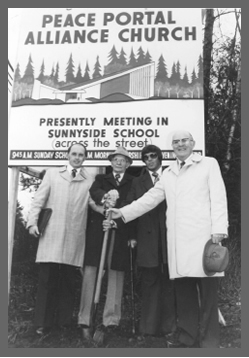 As the church continued to serve the South Surrey/White Rock peninsula, it became apparent that it had grown to the place where it needed to have its own facilities. In a bold step of faith the congregation purchased the property of the church’s current site on the corner of 152 Street and King George Blvd. This growth included a name change in February 1979, to “Peace Portal Alliance Church”. God provided the congregation with a spirit of hope and generous sacrifice and they were able to build a church home which was dedicated on May 31, 1981. As the church has grown the need to expand has resulted in the current facility and campus. It has been clear throughout that the facility is a means to a greater end. It provides a home base for the congregation to worship, fellowship and to serve the varied needs of the community. The establishment of homes and education for orphaned children in Uganda and for children who were unable to have a school in India. A wide range of ministry programs that serve children, youth, young adults, adults, and seniors. Supporting numerous International Workers who have gone out to help meet the needs of people with the love of Jesus in many countries around the world. Ongoing ministry and care to hurting people in our community. Specialized ministry programs to help children and youth and to support families. Partnerships with many organizations in the community dedicated to help meet specific needs such as single parents, homelessness, addictions, education, mental health, grief and loss.